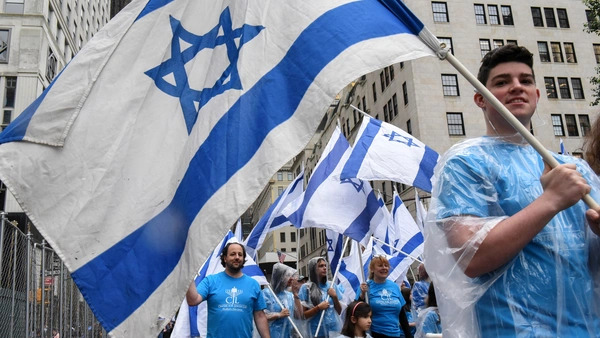 People carry Israeli flags while participating in the "Celebrate Israel" parade along 5th Ave. in New York City (Stephanie Keith/Reuters). A Palestinian-American activist's 2012 tweet unleashes a firestorm. But Zionism, good or bad, is not that weird. This article was originally published here on Salon.com on Sunday, August 13, 2017. One can understand Sarsour’s anti-Zionism. She is Palestinian-American. Given Palestinians’ history of loss and dispossession as well as the way in which the Arab-Israeli conflict is framed in the United States to favor Israel’s narrative, it should not come as a shock that Sarsour is hostile to Israel. She also has a lot of followers. A quick check of Twitter, Facebook and Instagram reveals about 227,000, 186,000, and 74,000 followers on those social media platforms respectively. It stands to reason that not all are supporters, but it is clear that Sarsour is an influential voice. So when she declares that Zionism is “creepy,” it no doubt has an effect on how people think about Israel and its legitimacy. Because creepy connotes something strange and unnatural, her tweet has the practical consequence of making it easier to boycott Israelis and Israel (likely her intention, given her support for the Boycott, Divestment and Sanctions movement, or BDS) or to use “Zionism” and “Zionist” as epithets. To subscribe to the notion that Zionism is somehow abnormal, however, reflects a basic illiteracy in the history of the development of nationalism. As Shlomo Avineri wrote in the introduction to his edited volume “The Making of Modern Zionism: The Intellectual Origins of the Jewish State,” Zionism is the product of a complex interaction of European Jewry, Enlightenment ideals, and nationalism in the late-18th and 19th centuries. It was a milieu in which identity was being forged by the dialectical relationship between values that were alleged to be universal and the particularity of geography, culture and historical context. In France, for instance, in conjunction with liberté, egalité et fraternité, there was also an emphasis on what it meant to be French, which was inextricably linked with land, language and France’s contributions to Western civilization. Similar developments were happening all over Europe, which were instilling people with ideas about being French or German or Polish, for example. Jews, who prior to the Enlightenment had been outcasts in European societies because they were not Christian, were not immune to the effects of the Enlightenment and nationalism. As they became more accepted in European lands, Jewish identity crystallized in response to the same sets of issues and stimuli as the people around them. As Avineri explains, there remained practical problems for Jews becoming integrated in secularizing societies, though over time many did and thought of themselves primarily as French or German, though their neighbors clearly did not. More enlightened secularizing societies did not bring an end to the persecution of European Jewry. More important to Zionism’s development, however, were Jewish efforts — parallel to those of Germans, Poles, the French and others — to discover and understand their roots. Given the history of the Jewish kingdom’s defeat, and exile, the search for identity led naturally to Palestine, the revival of Hebrew as a secular language, and the restoration of the Jewish nation (in contrast to Judaism as a religious sect). These are the basic tenets of Zionism. At a level of abstraction, they and their origins fit neatly within the general trajectory and history of the development of nationalism, self-determination and identity pretty much anywhere. Now, of course people may disapprove of Israeli conduct, whether it is the measures the Israel Defense Forces take to control Palestinian access to Israel that the Washington Post’s William Booth and Sufia Taha described so vividly in late May; the subtle but unmistakable efforts to push Palestinians out of Jerusalem; or the Panopticon-like security measures applied to Palestinians (which are genuinely creepy), to name just a few. Whether misguided, extreme or unnecessary, they fall within the realm of what many Israelis consider to be legitimate security measures and thus an obligation of their leaders. Security can, of course, be used to justify anything. The Israelis are as guilty of this as their neighbors and, increasingly, the United States, where a 5-year-old can be separated from his Syrian mother and handcuffed at Dulles International Airport as part of the supposed effort to protect the American people.